The number of first-time buyers purchasing a home has reached its highest levels in a decade, despite the average property price in the capital having risen by 48% in the same period, now standing at £419,608[i]. One of London’s largest housing providers, Notting Hill Genesis, is offering an exclusive deal to this valuable group of homebuyers looking to make the leap onto the housing ladder in the vibrant north London district of Wembley. 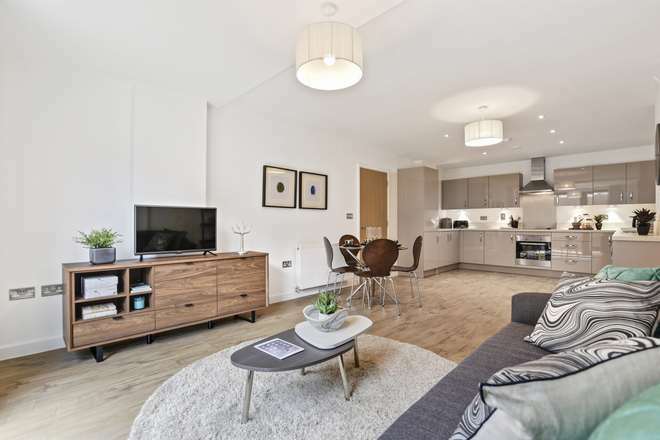 Purchasers who reserve one of the stylish one or two-bedroom apartments at its new development Parkside Place, and exchange contracts within four weeks, can enjoy free travel for a whole year with a TFL Zone 1-4 annual travel card worth £1,960[ii]. What’s more, all of the apartments at Parkside Place are available to buy with Shared Ownership. Ideal for Londoners seeking an affordable route into a new home, the scheme allows purchasers to buy between 25% and 75% of the property value, paying subsidised rent on the remainder. Residents can then increase their share over time, all the way up to 100% and outright ownership. Buyers at Parkside Place can secure a one-bedroom apartment with deposits starting from just £8,000 – over £100,000 less than the average amount required to buy a home in the capital[iii]. Residents can make full use of their free travel, Parkside Place is less than half a mile from Sudbury Town tube station, where it connects residents directly to the West End via the Jubilee line in around half an hour. Even closer, Sudbury and Harrow Road station has National Rail services to Marylebone station in just 17 minutes. London retail hotspots including the London Designer Outlet at Wembley Park, Brent Cross Shopping Centre, London Westfield, and Oxford Street can be reached in under an hour. The world-famous Wembley Stadium and SSE Arena are close to home, both of which host high profile sporting fixtures and concerts. Nearer to home, Parkside Place is ideally located to enjoy everything the lively borough of Brent has to offer. On the doorstep there are a wealth of green spaces providing an easy escape from the bustle of London life; the historic Barham Park is a five minute-walk from the development, a popular spot to sit back and relax. For buyers favouring an active lifestyle, Vale Farm Sports Centre is under a 10-minute walk away, and the new Wembley Leisure Centre is less than two miles away, perfect for a quick workout in the gym or a swim and sauna. Just over a mile away is Wembley High Road, providing a variety of high street shopping, dining, and nightlife opportunities. Perfect for those getting onto the property ladder, the homes have been thoughtfully designed, creating light-filled open spaces, adaptable for modern living. All homes come with Amtico flooring throughout and fully-fitted kitchens with a range of integrated Zanussi appliances and contemporary gloss units, as well as pristine bathrooms, and en-suites to some apartments. All Parkside Place properties additionally benefit from either a private balcony, patio, or terrace. Residents have access to secure internal cycle storage facilities, making getting around the capital even easier. Commuters at Parkside Place have an excellent choice of travel connections. National Rail services and the Bakerloo line run from Wembley Central to Paddington in just twenty minutes. Sudbury Town underground station provides services into Covent Garden via the Jubilee line in under 40 minutes. The North Circular, A40 and the M4 are all within easy reach, taking motorists into central London and connecting to the UK’s wider motorway network. The area is well served by several bus routes, while many local amenities are in comfortable walking distance making it easy to get about town. For jetsetters, Heathrow airport is only 12 miles away.